Butlers Bingo goes to Blackpool! For the first week of September Butlers Bingo will be running the Blackpool Lights Giveaway worth £4460! The fun begins on the 1st and will play through until the 7th September. Look out for the special Blackpool Lights Game to get in on the action and score yourself a few extra BBz, it’s sure to light up your week! If you’re the Full House winner in a Blackpool Lights Game you will score yourself an extra £4BBz and you’ll be very popular with your Nabors who will each receive an extra £1BBz. The following week the Butler jumps aboard a train in his £5150 Locomotive Giveaway which will run between 8th and 15th September. The Locomotive Game will play daily and will offers £3BBz extra to the Full House winner, an extra £2BBs for 2 lines and £1BBz extra for 1 line winners. So after visiting Blackpool and jumping on a train the Butler heads to Outer Space with his next giveaway worth £4475. Join him between 16th and 22nd September in the special Outer Space Game where you can win an extra £4BBz for a Full House and wangle your Nabors an extra £1BBz each too! New members who join Butlers Bingo will receive £10 free bingo no deposit required bonus! Use this to have a go on all the Butler’s finest games and if you like what you find head to the cashier and fund your account. First deposits are met with 150% first deposit bonus up to £150 so if you spend £10 you get an extra £15, if you spend £100 you get an extra £150 which is pretty great. 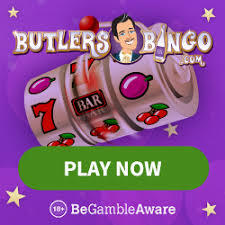 Butlers Bingo is so keen for you to enjoy yourself and keep returning to the site that they even give you 25% re-deposit bonus on every subsequent deposit you make! i love blackpool, go there nearly every year to see the lights, amazing to be part of, the place to be anytime of the year.